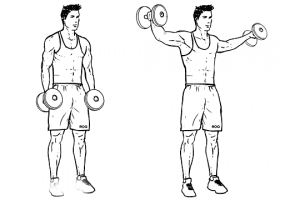 If you want bigger, stronger looking arms – you know the one’s the bust through your t-shirt (not literally!) then your going to want to check out this workout which i’ve put together for you. All you need is a pair of dumbbells! I’d also suggest blasting some music in the background to get you all fired up! It’s a circuit session. 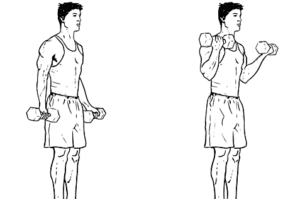 So to start with you’ll do Dumbbell curls, then go straight into Push ups, and then finally Side raises. 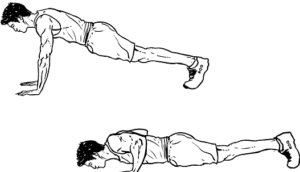 No rest between the 3 exercises. On your first round complete 30 reps of each exercise, then rest for 60s, then go down to 25 reps for each exercise, rest for 60s, then down to 20 reps, etc, etc all the way down to 10 reps.
Now go and build those ‘superhero’ arms and let me know how you get on!